The cost to our country to combat this health epidemic is in the billions and results in a startling realization that for the first time, a high percentage of children may not outlive their parents! For 13 years, Healthy LifeStars, has helped lead the effort to overcome childhood obesity by growing kids into LifeStars using its innovative and nationally scalable LifeStar Challenge program. A LifeStar is a person who knows what it takes to live a healthy life and does it every day. Our goal is to build The LifeStar Movement by creating LifeStar Communities around the country. Each LifeStar Community supports the motivation and education of their kids and their families, especially the “underserved,” to commit to living active healthy lives, now and in the future. I Can Do It! Setting personal health goals. I’m Active! Taking part in vigorous physical activity every day. I Eat Right! Eating the right foods in the right amounts. The proven LifeStar Challenge, which is a before and after school program, targets elementary-age kids and their families, in schools and youth-serving organizations. All of the information required to implement The LifeStar Challenge and train your LifeStar Coaches is delivered online, allowing us to impact kids across the country with our health and wellness experience. 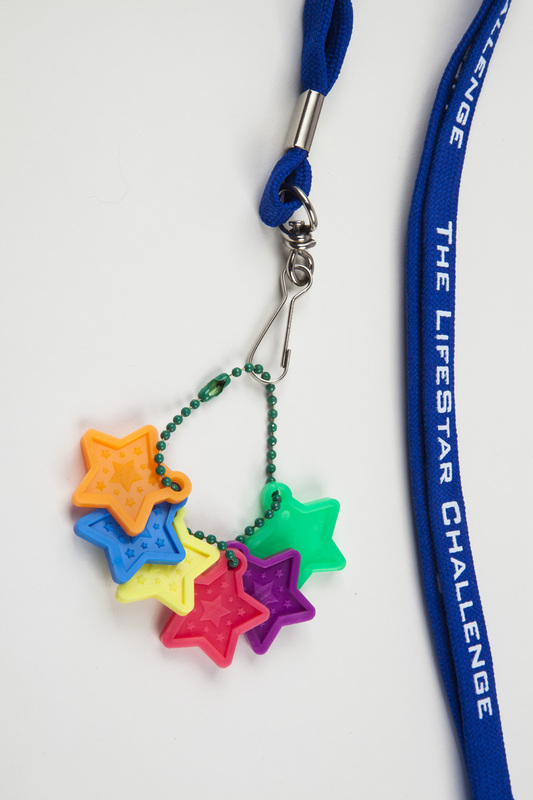 Each kid receives a lanyard and chain to display their star reward tokens. A kid receives a plastic LifeStar when they demonstrate their knowledge of the 3 healthy habits and participation in the program, as well as at the very end, when they become a LifeStar! The new LifeStars commit to living an active, healthy life now and in the future. The strategy for inspiring kids to make this commitment is simple yet powerful! The LifeStar Challenge has served over 24,000 kids. It’s a fun program for kids and their families and it encourages kids to take personal responsibility for their health. Kids and their families share a positive and rewarding experience together as they learn about and practice living active healthy lives. The name KSS (Kids Sports Stars) was changed to Healthy LifeStars, same program, new name. The LifeStar Challenge is easy to implement and everything you need to get your kids started is included in a simple kit . This lanyard and the little plastic LifeStars are what the kids earn every time they achieve one of the goals they set for themselves. You would be amazed at how proud the kids are to receive and show their stars to their friends and family. To reinforce the importance of living an active healthy life, we try to recognize and reward our kids when they demonstrate and make a commitment to each of the 3 Healthy Habits. As part of our Rewards and Recognition system, we promote a celebration event at the end of each program season where kids, their families and the local community can show their support for the effort the kids have made to live healthy lives.